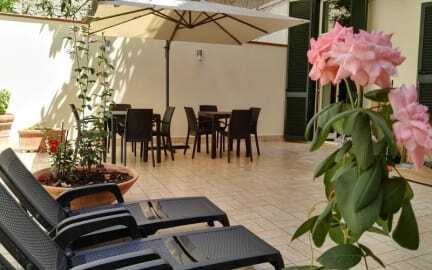 B&B Al Centro Storico is a complete apartment and recently renovated in the coolest area of Naples. The Terrace at the level of the b & b is the ideal place to have a little relaxation and is practically attached to the Cathedral of Naples. It is located in the historic center in Via dei Tribunali at the intersection with Via Duomo also called the Via dei Musei. This is the preferred area by young people but also the most rich in artistic attractions and folklore. B&B Al Centro Storico is a few meters from the bus stop and just a few hundred meters from Dante Station and Duomo of the underground line 1. The b&b has big, bright, comfortable and colorful rooms. You can take advantage of our big and sunny terrace to chill out and enjoy your stay. We offer many facilities such as Free WiFi, Free Breakfast,and much more. Check in from 12.00 to 23:00. Payment upon arrival only by cash. We do not accept group booking bigger than 5 people and children under 16 years old. Free WiFi in common areas available. Smoking allowed in the outdoor terrace. Laundry facilities (washing machine and dryer) available for EUR 12.00. Please inform b&b al centro storico of your expected arrival time in advance. All electricals need to be swiched off when not in the bnb. It is strictly forbidden to invite friends inside.